"From afar, it appears to be a medium sized spider about an inch across, possibly dead and dried out, hanging in the center of a spider web along the side of the trail. Nothing too out of the ordinary for the Amazon. As you approach, the spider starts to wobble quickly forward and back, letting you know this spider is, in fact, alive. Step in even closer and things start to get weird- that spider form you were looking at is actually made up of tiny bits of leaf, debris, and dead insects. The confusion sets in. How can something be constructed to look like a spider, how is it moving, and what kind of creature made this!?" The spider is a member of a known spider genus- Ricinulei. This spider just happens to be one of the rarest spiders in the world, so rare that it has only been found in remote and inaccessible parts of the Amazon. How did the supposedly primitive people travel so far from their homeland, crossing the formidable barrier of the Andes to catch a specimen? They even duplicated minute details of the spiders anatomy, normally visible only under a microscope (reproductive organs). 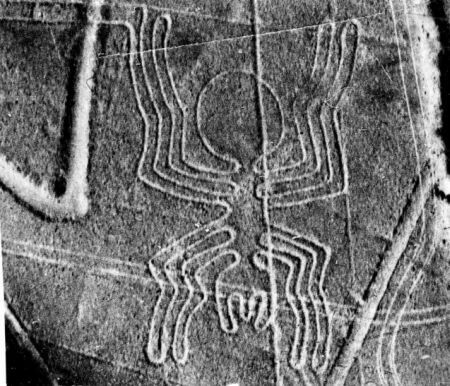 Did the Nazca people see how the tiny spider made a large version of itself, or was a fable told along those lines that caused people to try to duplicate the fable, or was it all pure coincidence or something else?